Our heavy duty Sportscraft steel swivel adapters are imported from Europe and will allow your front driver or passenger seat to swivel. These work with all models of the Dodge ProMaster. *Not compatible with suspension seats. Not compatible with powered seat base. Swivels are offset so they will turn without having to open your door. Center wiring chase allows for wiring for seat sensors and heated seats. 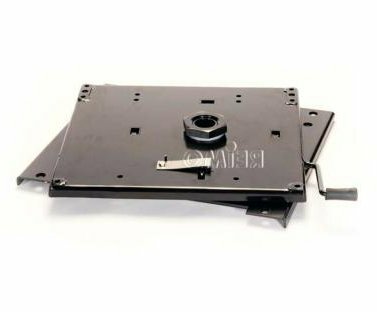 Swivels are designed specifically for the ProMaster Chassis, and are not a modified generic swivel. Very happy with this swivle... very easy install with new bolts included. Very smooth sturdy swivle. Does raise seat a little bit, but not bad. Very happy with the purchase and delivery from EuroCampers, thanks! Worked great. Easy install. Notice that unlike others I have seen that the rotation point on this brand is offset to make swiveling around obstacles (steering wheel and frame members) easier. On install just make sure you unscrew the correct bolts (6 total) on the factory seat to remove the upper portion. If you remove the entire seat you will see that there are 6 bolts on the underside of the rails. Don't unscrew these, they are hard to access. Only unscrew the easy to access 6 bolts on the top side of the rails (Slide seat back and forth to access). Arrived on time boxed well install went fairly Smooth, one bolt that attached it to the base was stripped and had to be replaced as well had to lubrcate as it squeaked nothing a little Oil could not take care of. Would be nice if there was a lock detent in the 180 degree position. The install is very easy. Just take your time undoing the airbag wires and make sure to carefully zip tie everything such that there is no pulling on the wires when you rotate the chair either direction. Only small complaint is that the release mechanism is on the side of the chair where you already have very limited room to squeeze between the chairs to get in back. And you do still need to bend the top front rod a little to clear the swivel but its such a small amount you can just push it down an 1/8".